Have you ever been driving on a road, jamming to your favorite tune, and then all of a sudden your vehicle hits something that sounds frightening? Your immediate response is to turn down your radio, pull over to a safe spot and to check to see what it was that caused that sound. In a worse case scenario, you blow out a tire and/or jack your front end out of alignment. Michigan potholes are back–only this time they’re worse than ever before. With all of the havoc that it’s causing, frustration from drivers is an understatement, especially for those that live in the metro Detroit area. Understanding and avoiding them can help you avoid pothole damage car repairs. Potholes are typically created when snow and ice form together and melts. As the moisture seeps into the road pavement, it then freezes, expands and thaws. This not only produces a gap within the pavement, but it also weakens and forces the pavement to rise. 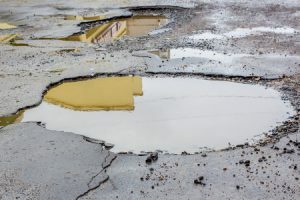 As the weight of the vehicles continue to pound on the raised section on the road, and as the temperatures constantly continue to change on a day-to-day basis, it thus creates a pothole. As you all might know, the state of Michigan has experienced one of the craziest winters ever this year. There has been a ton of snow, as well as the weather rapidly warming up and cooling down over the span of weeks. Because of the extreme weather changes, many potholes have formed. How to safely avoid them? Well, first things first, drive cautiously and very carefully. Make sure that you keep a lot of space between you and the vehicle that’s in front of you. You may also want to be sure that your headlights are working properly and that you keep your windshield clean. Being alert for puddles that could very well be potholes filled with water is something to keep in mind as well. Need a Wheel Alignment or New Tires? Did you just recently hit a pothole and now your tires are ruined? Perhaps, the pothole has caused for you to need a whole new wheel alignment. As upsetting and aggravating as this all can be, we want you to know that we at Mr. Muffler will give you what you need for a great, affordable price. Along with our front-end damage repair, we also are a full-service auto repair shop in Michigan. Contact us or visit our location today.